Growing up, my family didn't celebrate Dia De Los Muertos. It wasn't until became an adult that I started to learn about the traditions behind the special day of recognizing those who have passed on. 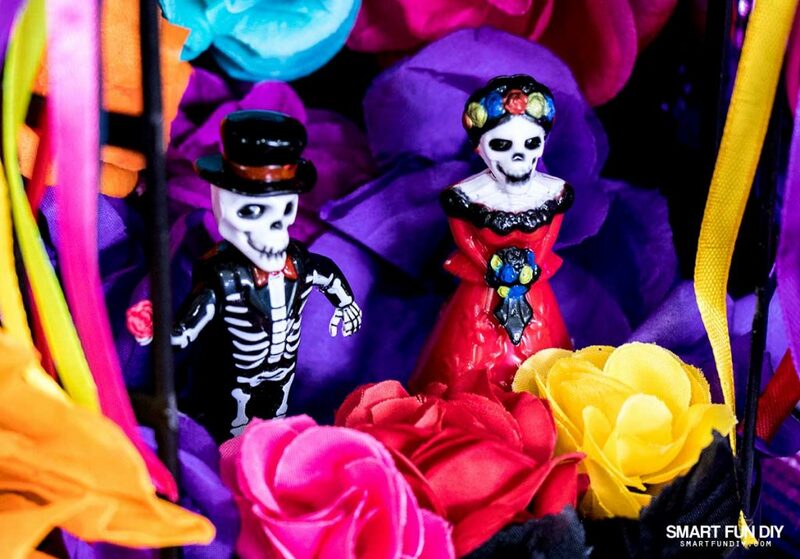 Whether you love the aesthetic of Dia De Los Muertos, you mix it with your Halloween decor, or you're just curious about what “Dia” is all about, you're in the right place. 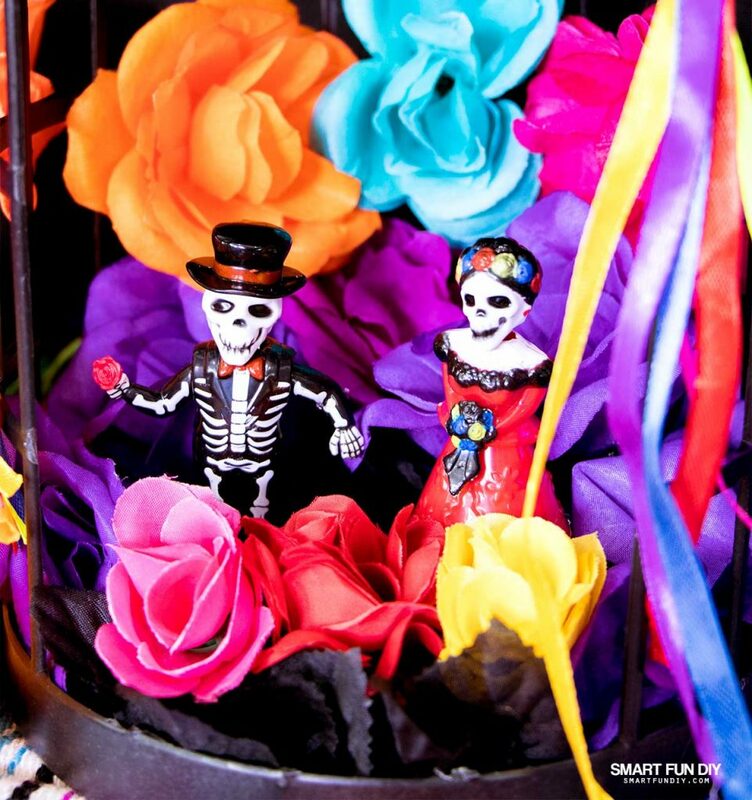 The cornerstone of Dia De Los Muertos is the shrine or ofrendas. 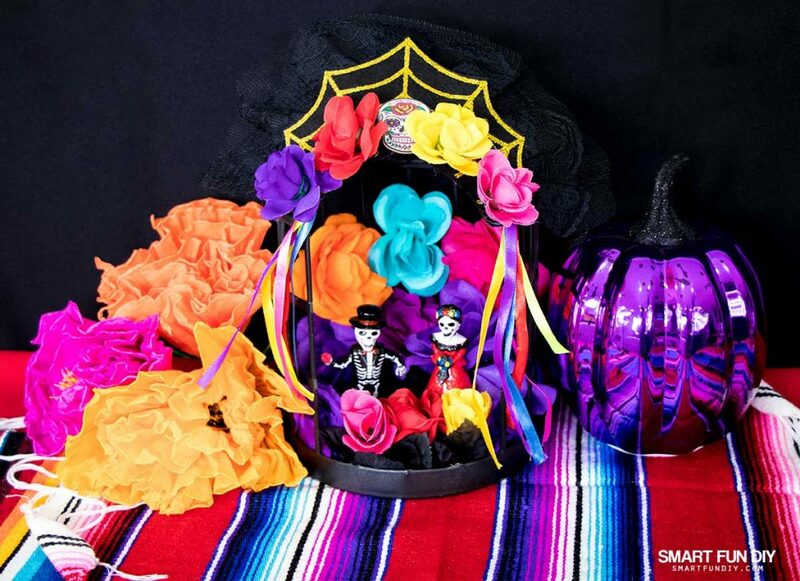 This year we will be creating our own ofrendas, a DIY Dia de Los Muertos shrine, using supplies from 99 Cents Only Stores for under $10. You don't have to spend a lot to create a gorgeous display! 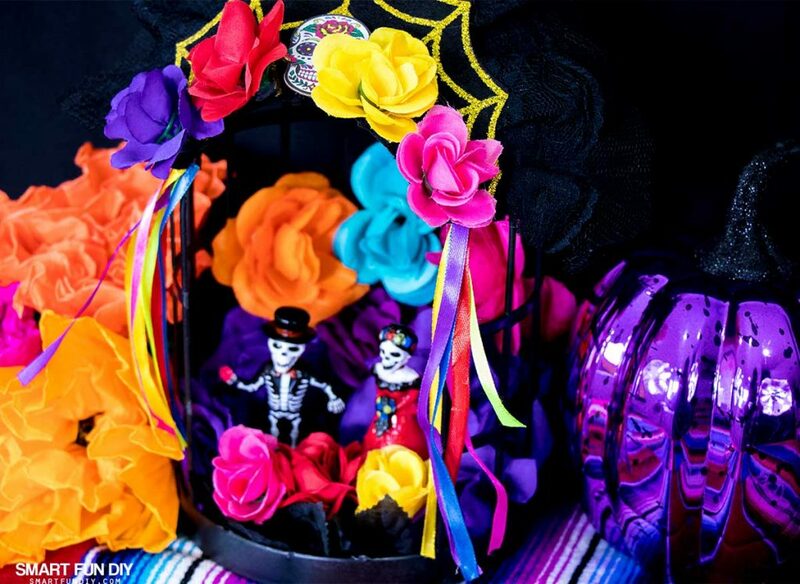 Does the 99 really have DIY Dia De Los Muertos Shrine supplies? 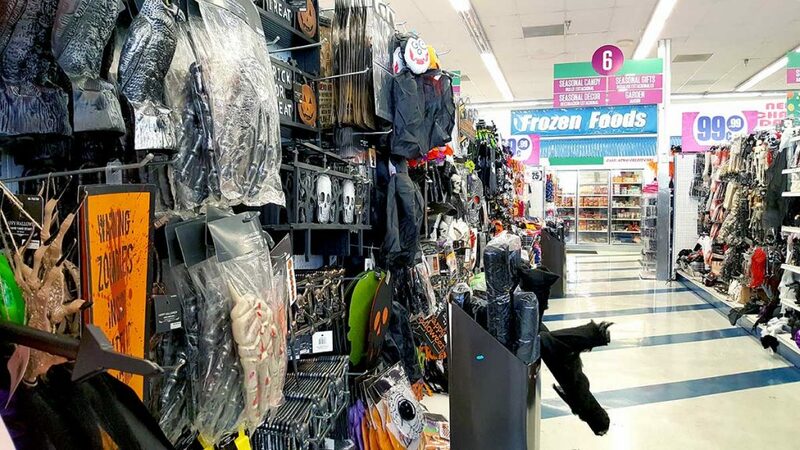 There are two full aisles of Halloween decor in my local 99! There are costumes and gory decor and cutesy party supplies but what I really love is that now the 99 has Dia De Los Muertos themed items to help us all celebrate. Our local 99 is located on the way home from school … it's the perfect stop for this self-confessed 99er. Even my kids love browsing the aisles, where they can find their favorite brands at prices we can't find elsewhere. The 99 helps us stay on budget but still create a home full of gorgeous (or scary!) holiday decor. They always have such amazing deals that I can never pass up. Just the other day, I bought a couple of mangoes for only 99 cents and I stocked up on organic blackberries for 99 cents a pack! I normally 4 times that for fresh organic blackberries elsewhere!!! 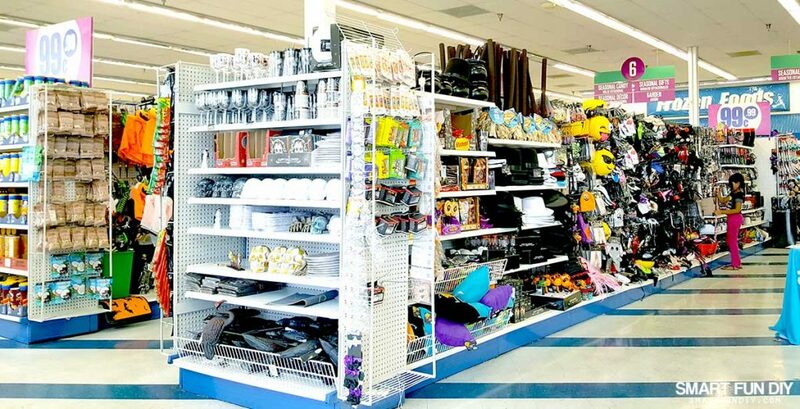 You can grab decor, fresh produce, home improvement items, and everything for your next party all in one stop at the 99. 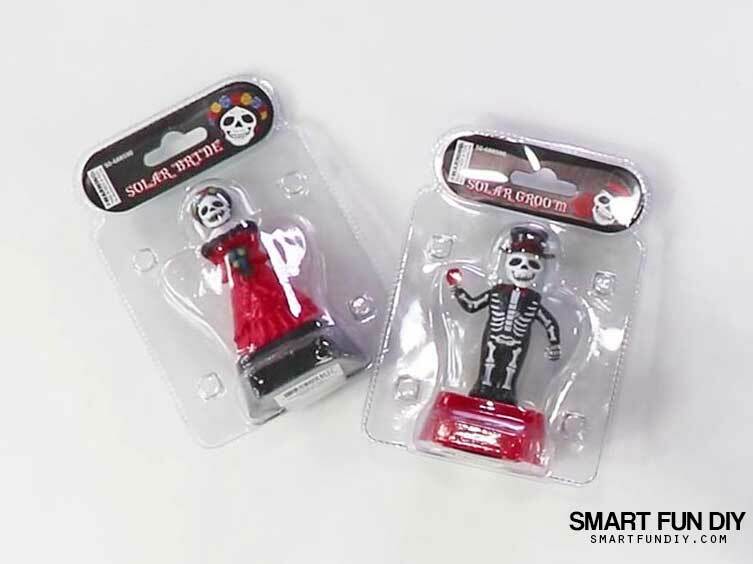 Earlier this month, while walking around the 99, I found a pair of festive solar powered bobble heads for $0.99 each that are Dia de Los Muertos themed. 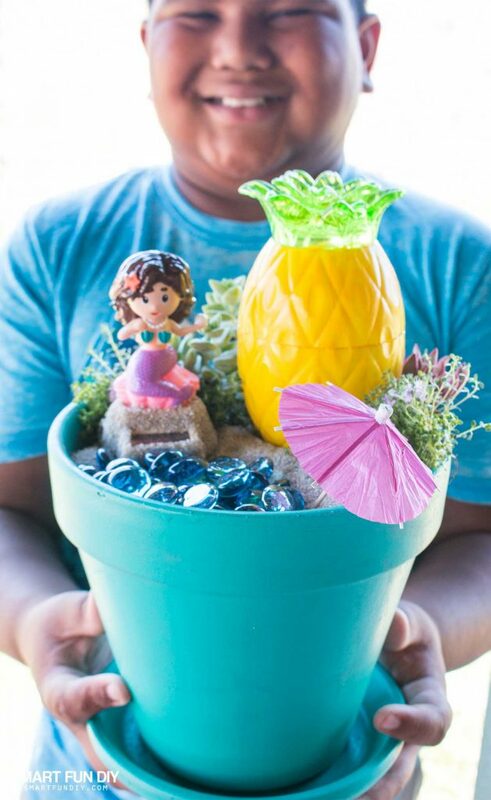 They were similar to the solar powered mermaid bobblehead I got at the 99 a few months back when I made this DIY Mermaid Fairy Garden! That's when I knew I wanted to build a shrine for Dia De Los Muertos this year! There is always something new and exciting at the 99 … you never know what you'll find when you “do the 99”. In central and south Mexico, Dia de Los Muertos, or Day of The Dead, is the day when families honor their loved ones who have passed on. This holiday begins at midnight on October 31st , when it is believed that the gates of heaven are open. On this day, the small children who have passed away come down first to spend time with their families and on the last day, November 2nd, the adults follow to enjoy the celebrations their families have planned for their visit. The altars or shrines people set up for Day of the Dead are called “ofrendas”. Ofrendas means “offering” in Spanish. These altars are not for worship but more to honor and remember ancestors. Growing up, my family didn’t celebrate Dia de Los Muertos but as an adult, I’ve come to appreciate its importance and the ancestral influence it has had on Mexican culture. Even though they are not the same thing, I’ve come to incorporate elements of this holiday into my Halloween traditions. 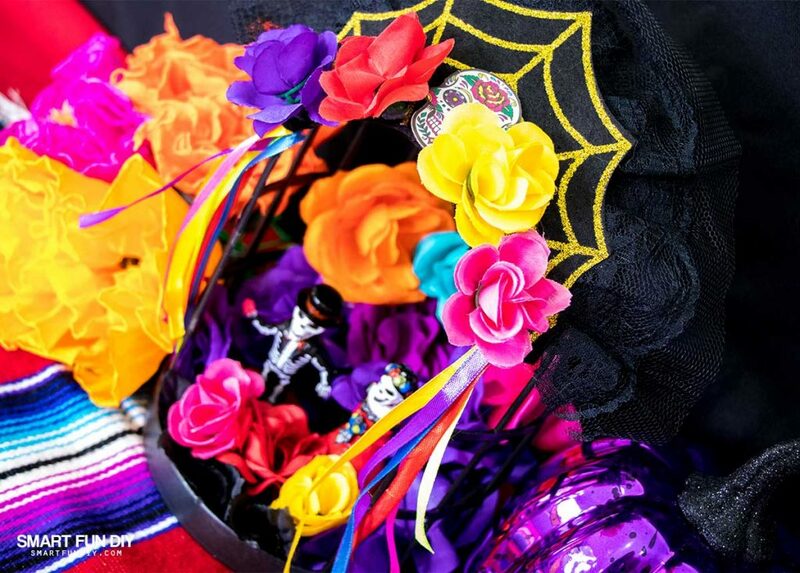 Whether you are Latina or not, you can enjoy the traditions of Dia De Los Muertos as well. The solar bobbleheads I got from the 99 will represent the loved ones who have died. 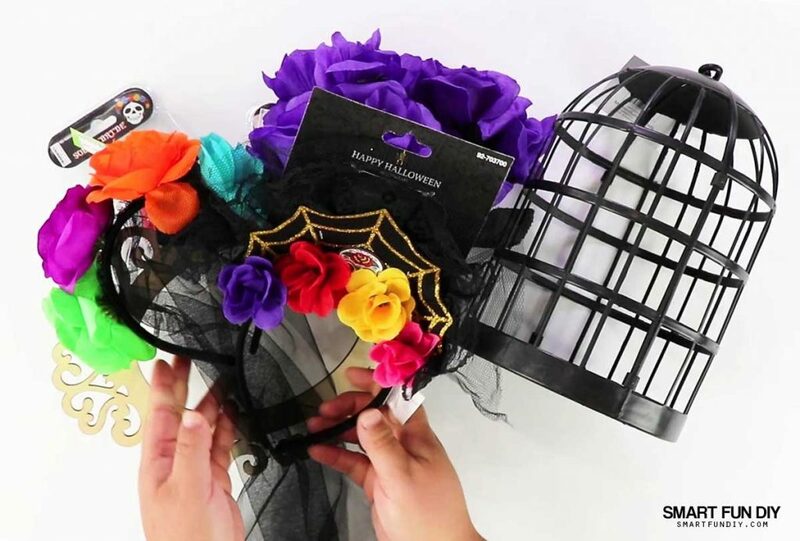 I found a plastic bird cage decoration for Halloween at the 99 that we can use the house the bobbleheads and attach flowers to. 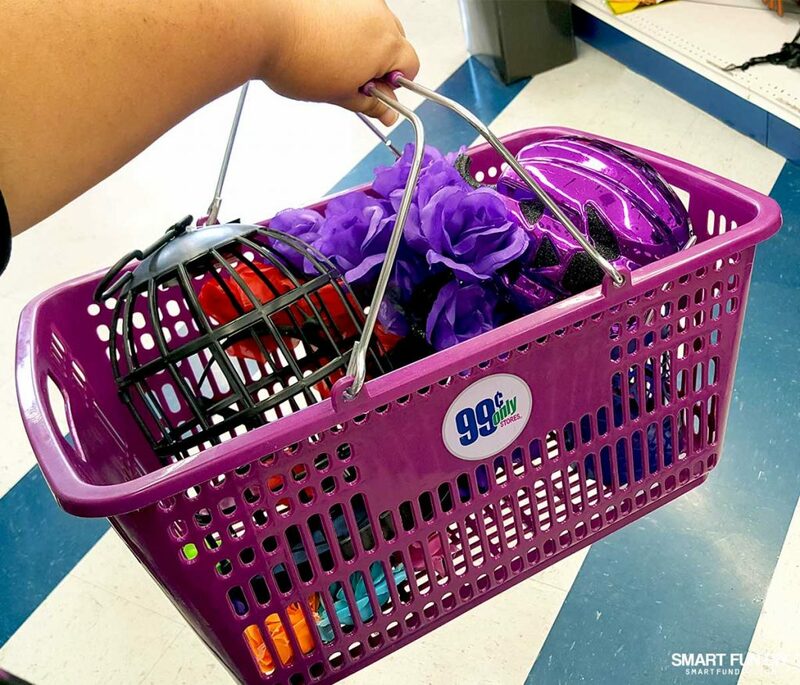 The 99 has lots of fabric flowers so I grab some of those as well as a few Dia De Los Muertos headbands to decorate the birdcage. When Dia De Los Muertos starts, we can bring in fresh marigolds and flowers as well as the food items to add to the display. Rather than candles, I added a battery operated light up pumpkin from the 99 for just $1.99. Again, when it gets closer to Oct 31, we'll add beeswax or paraffin wax candles. I bought the wood frame from the 99 to put around the bird cage but once I cut the cage open, I changed my mind. It would have looked really cool though! You could also use the frame to add a photo of a loved one who passed away to the shrine. Once the shrine has been completed, it needs to be displayed in your home. 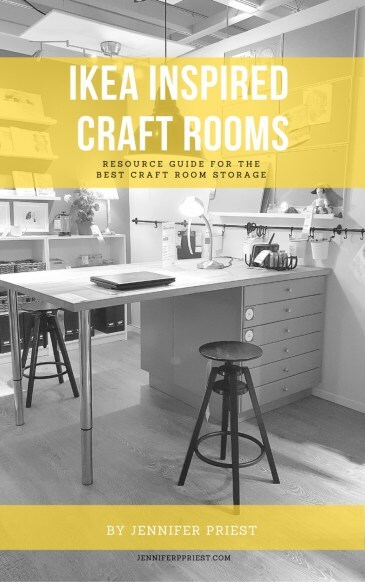 You can put it by your front door or in a prominent place in the home like on a mantle. 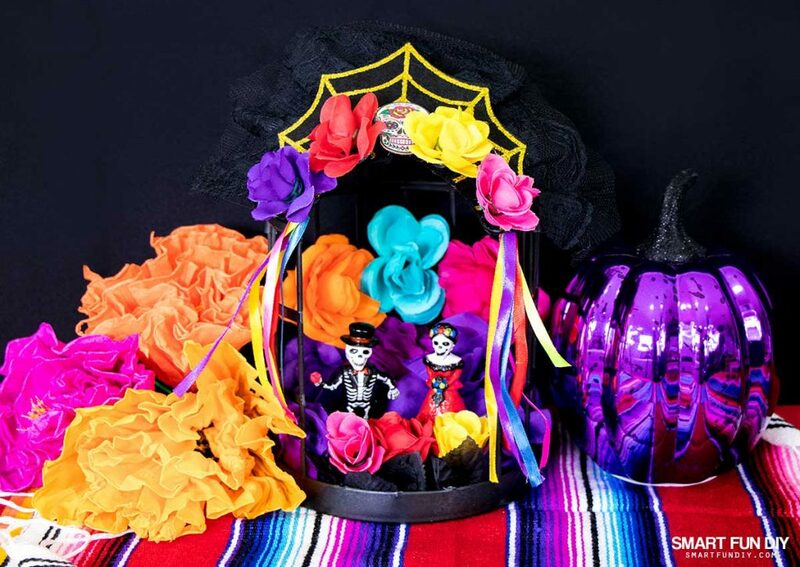 I covered a table with colorful tablecloths and Mexican textiles and then added the shrine, the light-up pumpkin, and some paper flowers I bought in Mexico to the display. How will you “do the 99” this Halloween or Dia De Los Muertos? 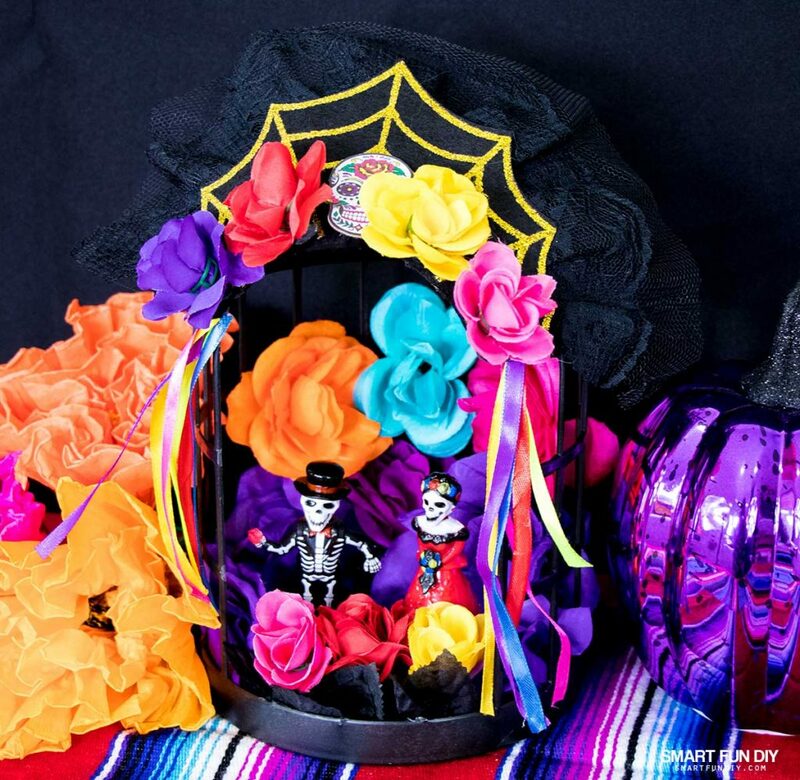 Share your Halloween and Dia De Los Muertos traditions with me in the comments below. I can't wait to hear about what you're planning!